Before you start writing a novel, it’s important to find a book idea that will sustain your interest. A strong idea will be a fount of creative inspiration right to the final page of your book. 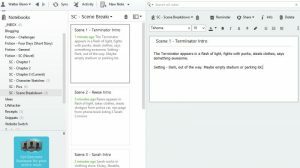 You can use Now Novel’s Idea Finder to brainstorm the elements of your central story idea. Once you have an idea, write it down in two to three lines. Print it out and stick it above your writing space so that you don’t wander too far off track when you draft. To win NaNoWriMo you must write 1667 words per day (on average). This will let you reach 50, 000 words within November. A lot to write in one sitting, especially if you’re juggling writing fiction with work, studies or other responsibilities. Yet if you write approximately 417 words, four times a day, you will reach your target. 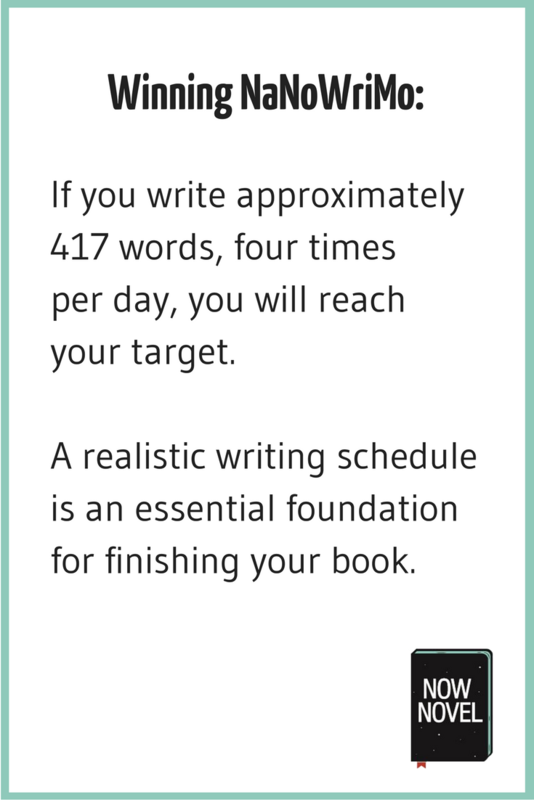 A realistic writing schedule is an essential foundation for finishing your book. Although you could try writing your first novel without an outline, plot outlines help. Especially if you haven’t written long-format fiction before. The beauty of plot outlines is that there are many ways to create them. Find a plot outlining method that suits your working style (and patience level). If you do write ‘by the seat of your pants’ (i.e. you’re a pantser), if you get stuck you can still go back and outline your story. If you get to a point where you’re not sure where your story should head next, write short, one-paragraph summaries for each chapter so far. This will help you condense the overarching story so you can see where it’s going (and perhaps where it’s gone wrong). 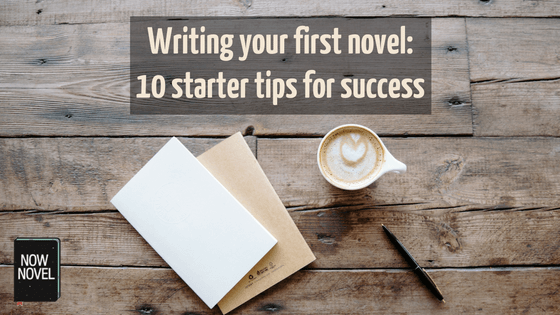 When writing your first book, there are several things you need. An idea you’re excited to work on, a plan, motivation, focus, and something holding you to your goal. This last necessity is key to motivation – accountability. A partner or writing coach will give you insightful feedback and cheer you on. Partnering up relieves the inherent loneliness of the writing process and yields useful insights. In addition, your partner will hold you accountable to your goal. Structure your writing relationship so that it is immediately useful to you. Discuss how you’d like to work with your partner. You might want to send sections for feedback chapter by chapter or only share outlines or scenes in isolation. When you’re writing your first novel, it helps to have all the resources you’ll need in an accessible place. If you’re writing a novel about a doctor, for example, create a folder for this character. Keep any medical facts or other details you will need for specific scenes in your story. Remember, also, to give yourself elbow room. Depart from your scene summary if you feel the story should go in a different direction. The main point of pre-scene writing is to maintain a clear sense of purpose for each scene in relation to your story arc. It’s crucial, while writing your first book, to give yourself breaks and time to process story ideas. As part of your writing schedule, include breaks and fun activities you’ll enjoy to reward yourself for persisting. This will help to break up your routine and add some variety. If you have a busy day at work or can’t sit down to write for another reason, find another creative solution. If you have a phone that has a voice recorder feature, dictate ideas for your story in spare moments. Take days of missed word count targets and divide the number of words you meant to write up between upcoming writing sessions. This is an important strategy during a deadline-driven process such as NaNoWriMo. You’ll make up for lost time easily. To truly make strides, write your novel in stolen moments. For example, while waiting in line or on hold during a phone call, you could write part of a scene in an email to yourself on your phone, then cut and paste this into your manuscript. Find ways to be productive and not let other obligations and duties get in the way of reaching your writing goals. 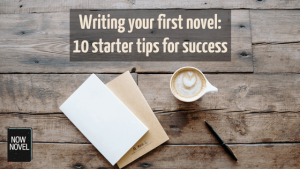 Whether you’re writing your first novel, participating in NaNoWriMo or writing to a rapidly approaching deadline of another kind, taking the steps above will foster success. Looking for a structured approach to writing a novel? Join the Now Novel community and get writing.